I completely forgot that school lets out like 5 weeks before Christmas–and that means that they’re holiday party is like NEXT WEEK! Ok, so this is all sorts of an exaggeration, but still–it’s very soon and I have nothing ready. I am considering a lot of yummy Christmas cookie recipes, and my front-runner? 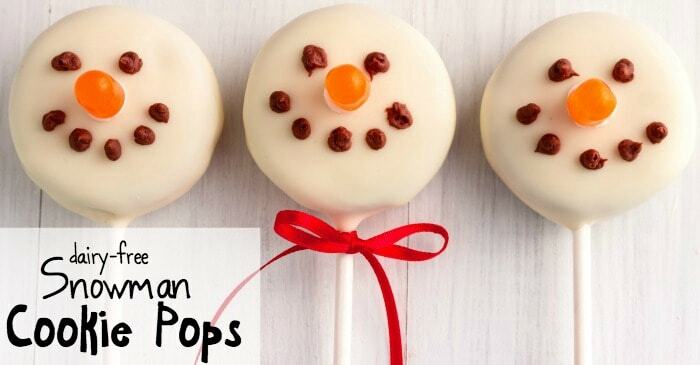 These Dairy-Free Cookie Pop Snowmen. Easy, fast, light and dairy-free, I can chow-down on a few and not have an upset tummy (and all the kids in the class can have it, too…heh). I tried out some really yummy peanut butter reindeer cookies that I’ll post about tomorrow, so don’t get distracted away from the snowmen. I know I can’t take the nutty ones to school, but they can certainly be enjoyed by my son and myself on the sly. Just don’t serve them to the toddler. But, again, we’ll talk about that tomorrow. LOL! 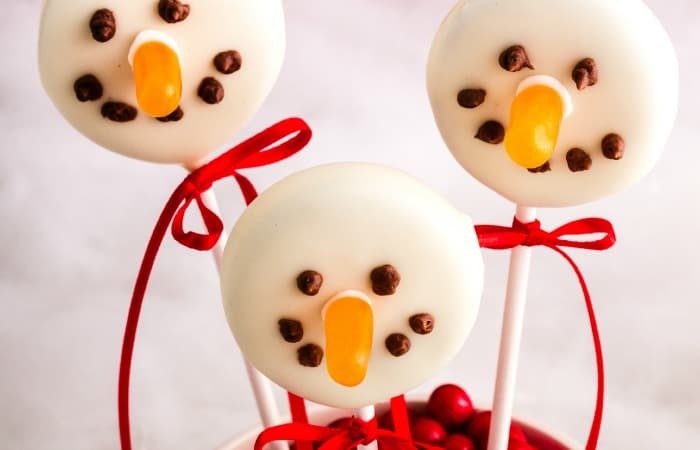 These Dairy-Free Cookie Pop Snowmen are easy, fast, light and dairy-free, I can chow-down on a few and not have an upset tummy (and all the kids in the class can have it, too…heh). Melt the white chocolate in the microwave in 30-second increments. 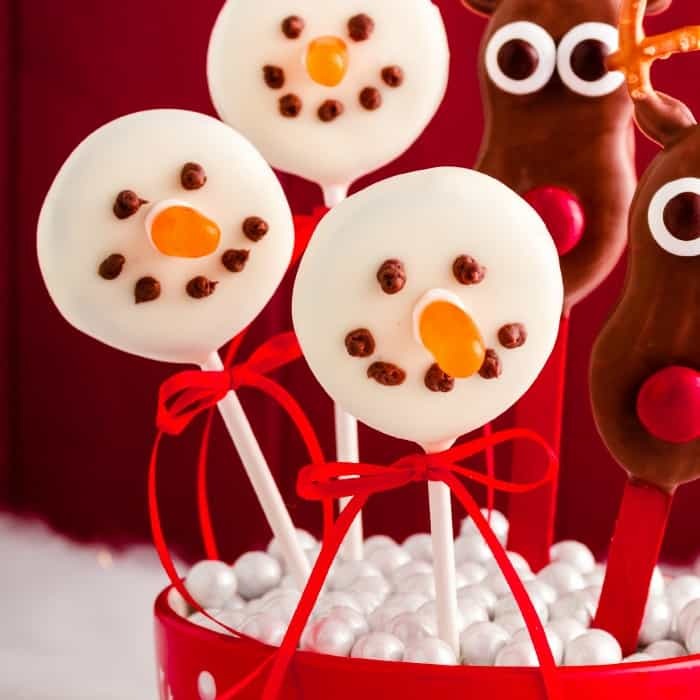 Dip a cake pop stick into the chocolate, then place it on a cookie at least 1/2-inch into the cookie. Remove cookies from the freezer and dip each one in the white chocolate. In the meantime, separate 1/8 cup of the chocolate from the herd into a smaller bowl. Place 5-10 drops of food coloring (black or brown) into the small portion of chocolate and stir. Add the corn syrup and stir. This should basically be the consistency of icing, but if it's too thick and unmanageable in a piping bag, add the vegetable oil and stir. LOL! Remove the cookies from the freezer and, using a piping bag and your smallest decorating tip, place a couple of eyes and a smile on each cookie. 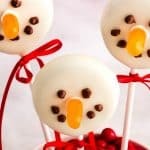 Take your candies and dip a little in the white chocolate, then place on the cookies' faces between the eyes and mouth.